New for 2014, we've improved the best in class price / performance to implement changes you've asked for. The new Guardian 22 is shorter, stronger, and quieter. And we didn't change the price. 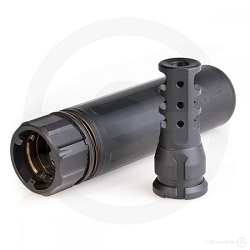 The entire serialized registered part (not just a thread insert, like a few of our competitors) is now made of heat treated 17-4 precipitation hardened stainless steel, protecting your investment in case of a catastrophic failure of your silencer. A 316 stainless steel tube to handle your most abusive use. All baffles are encased K baffles, providing a "tube within a tube" for ease of cleaning and durability. The first baffle is stainless steel, with all other baffles constructed from aircraft grade 7075 Aluminum for strength and durability. Length and outside diameter have been reduced. Sound level reduction is improved over the earlier Guardian 22 model. Retail price unchanged at $199. 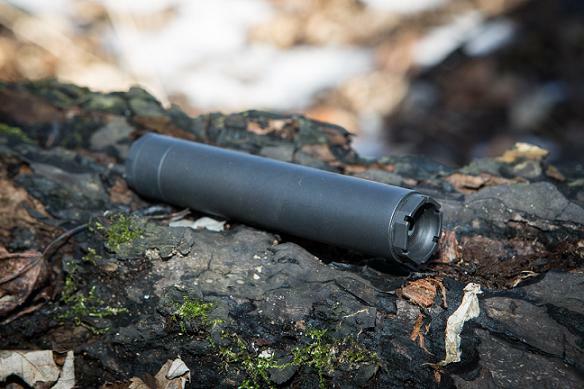 Your Guardian 22 can be upgraded at any time to the Guardian 22 SS or Guardian 22 Ti, giving you a path to to most capable rimfire silencer we offer.